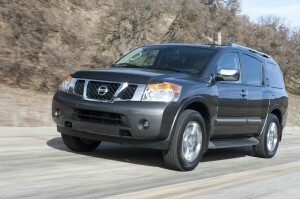 The 2011 Nissan Armada is offered in three well-equipped models — SV, SL and Platinum. Each is offered in a choice of 2-wheel or 4-wheel drive. All three models are equipped with a 5.6-liter Endurance V8 engine rated at 317 horsepower and 385 lb-ft of torque, along with an advanced 5-speed automatic transmission, heavy-duty fully boxed ladder frame and comfortable double-wishbone suspension. The 2011 Armada has a towing capacity of up to 9,000 pounds (when properly equipped). The stylish, powerful and roomy Nissan Armada enters 2011 as a premium full-size SUV designed to enhance spirited adventures with room for the whole family and their equipment. Every Armada SV comes with long list of standard equipment, including overhead console with multi-storage capacity, Dual Zone Automatic A/C, power windows and door locks, power adjustable pedals and more. The Armada SL adds an array of comfort and convenience features, including Nissan Intelligent Key, leather-appointed seating, RearView Monitor, Bluetooth Hands-free Phone System, premium Bose audio system with 11 speakers and subwoofer, power-folding 60/40-split 3rd row seat and auto-leveling rear air suspension. The Armada Platinum model includes heated front seats and steering wheel, power rear liftgate, moonroof, DVD Family Entertainment System and Nissan Navigation system with XM NavTraffic system with Real-Time Traffic Information and 9.3GB Music Box Hard Drive. This entry was posted in Car Buying Research Starts Here, Nissan_. Bookmark the permalink.